The first step of the Product export is setting the outcome and structure of your new export file. We call this "Destination Settings". In the Destination drop-down box you can choose if you would like to get your new export file as a URL, or as FTP. At the moment Syncee only creates CSV files, so you can just leave the File type settings as it is. There are many different file structures from which you can choose. The RAW structure is a freely customizable structure, which shows product variants and more product info (e.g. more than one image or option value) in different lines. The FLAT structure is a freely customizable structure, which shows product variants and more product info (e.g. more than one image or option value) in different columns. The Shopify Export feed is a predefined file structure, which looks exactly how Shopify can process a CSV. You won't be able to customize it. The Google Merchant feed is a predefined file structure, which looks exactly how Google Merchant can process a CSV. You won't be able to customize it. The Facebook catalog feed is a predefined file structure, which looks exactly how Facebook can process a CSV. You won't be able to customize it. 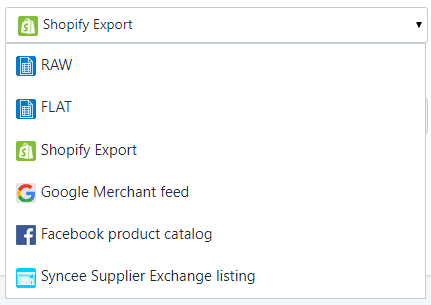 The Syncee Supplier Exchange Export listing has a predefined file structure, which exports all the product data that Syncee needs to list your products in the Supplier Exchange. Choose either of these and click on the Next button to save and move on.